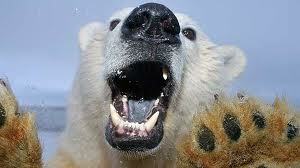 I feel hurt and violated and when I am backed into a corner, then I act like a rabid polar bear. My instinct is to hurt back and lash out and make you feel the same way. I am rabid because my beliefs and values are not being met; and rabid is how off and unexpected I can be. Then I rant and roar like a bear. I start clawing at you and want to rip you apart, limb from limb, until you breathe no more. Then you can’t violate or hurt me anymore. I will always take care of me and sometimes, I am ashamed of how I do it. I am used to manipulation and violence as a way of getting what I want. But now that I am clean, I realize that people aren’t listening to me. They just fear me. So I am trying to be constructively angry so that I can be heard and also help others to be heard and respected as well. It’s a slow process because of 41 years of the same old comfortable ways; but I will learn a new way. My bear won’t be clawing, rabid and scary. It will be soft and cuddly but firm and strong.